Recently I’ve been trying out different forms of textile design, specifically dyeing and weaving. The process of weaving is quite tedious and takes a lot of your time and dedication to execute properly. I started out experimenting different weaving techniques on a 4 shaft table loom. Before I created anything, I thought it was best to experiment with all the different patterns there are, as well as different color combinations for the warp (vertical threads) and weft (horizontal threads) designs. I highly recommend doing this before you attempt to create any real pieces such as scarves, hats, or any type of clothing. 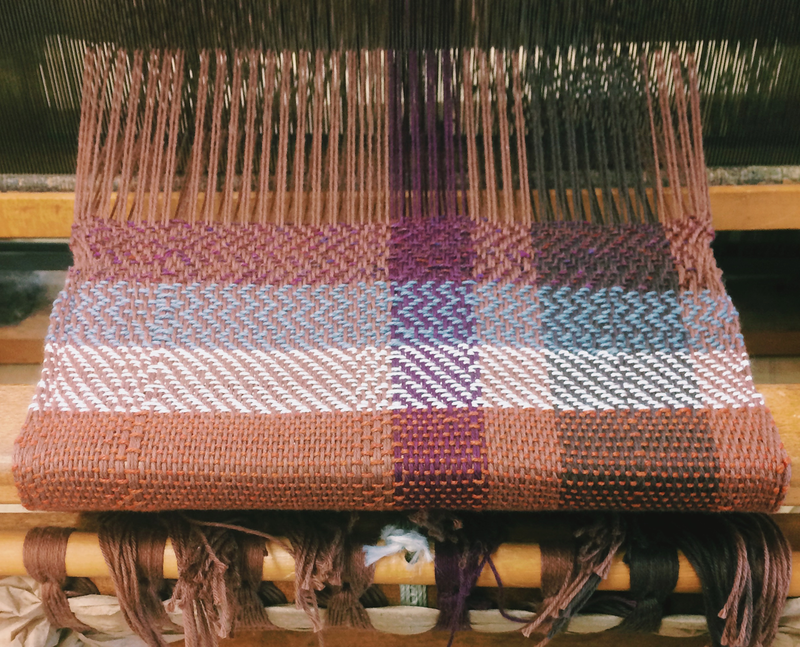 To begin the weaving process, you first have to make a warp design which is the vertical color scheme in whatever you are weaving. If you want the width of your finished piece to be a certain amount of inches, you must multiply that amount by 15. Therefore, if you want a width of 6 inches, you must make a warp of 90 yarns. You then can design a warp of whatever colors you want, as long as they all add up to 90 yarns. (example: 30 red, 30 yellow, 20 blue, 10 green). I designed my warp to be 10 inches in width, consisting of a pattern of 75 camel yarns, 15 purple yarns, 15 camel yarns, 30 dark drown yarns, and 15 camel yarns. Then you must decide how long you want your fabric to be and add 25% to the that length. For example, if you want your piece to be two yards of fabric long, you need the weft to be 72 inches plus 25 percent, or a total of 90 inches long. I made my scarf 80 inches long, so I cut my yarns to be 100 inches long. After you’ve figured out the dimensions of your warp you can begin to dress the loom. To dress the loom, clamp the loom to the tabletop. You will need to secure the end of the threads on the back rotating cylinder of the loom, put a yarn through each heddle, and then comb each yarn in the order of your design through the combing section of the loom. You will then need to secure the front of the yarns on the rotating cylinder in the front of the loom. This is obviously just a very quick overview of how to dress the loom, so if you’re a beginner you can look up more information either online or in instructional books on weaving. I found this process of dressing the loom quite challenging as little problems occurred along the way that I had to fix such as skipping a thread in the combing part of the loom or making a mistake in threading each yarn through the heddles in the correct order. Once I got my loom properly dressed however, which was a majority of the work for me, the weaving itself was easier to understand and fun to experiment with. 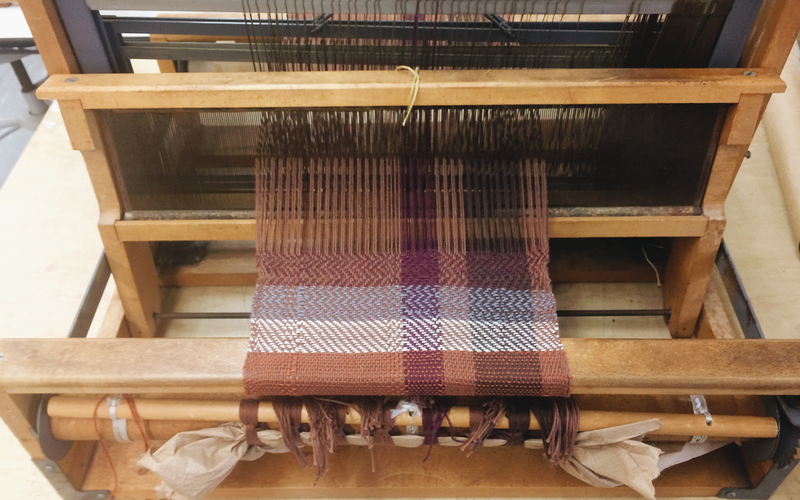 I experimented with different weaving patterns on the loom such as vertical herringbone, balanced twill, long and short twill, plain weave, as well as some of my own invented patterns. You can find some of these weaving patterns online, as well as additional ones. All of the patterns require threading yarn (the weft) through different shafts. For example, for a plain weave, you would put the 1st and 3rd shafts down and weave your yarn through, and then the 2nd and 4th shafts next. The different combinations of patterns you can experiment with on the loom are endless and are all extremely beautiful and unique. 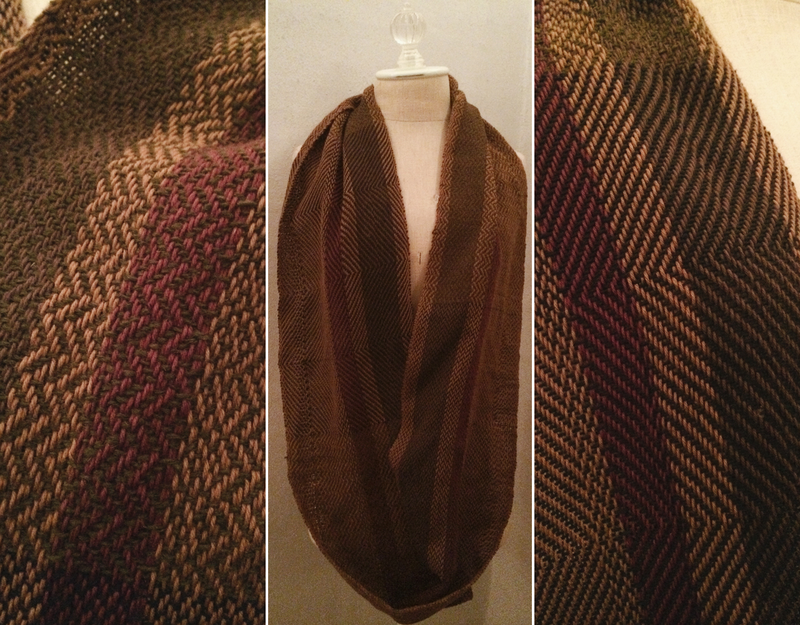 For the scarf I made (10″ x 80″) I wove 20″ of vertical herringbone with a forest green yarn, 20″ of my invented pattern in navy, 20″ of long and short twill in the same green, and then 20″ of balanced twill in the same navy. To make the balanced twill section of the scarf more interesting I alternated between the regular balanced twill, and then reversed the pattern of the balanced twill for parts of it. I unexpectedly still had some room at the end of my scarf for more weaving, so I repeated the same four sections, this time in 2″ increments instead of 20″. 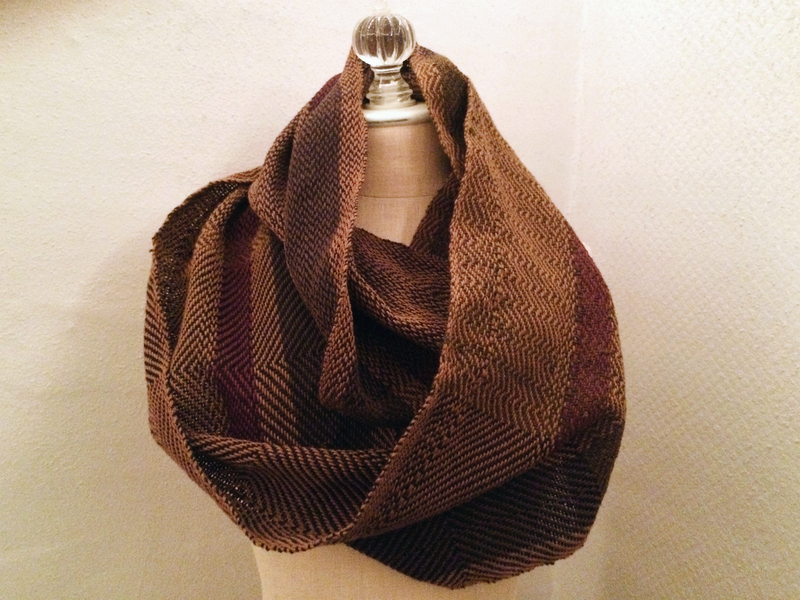 Overall, I am really pleased with how the scarf turned out and can’t wait to make more woven pieces soon. In other news, it is really exciting to see the medium of textile work being shown at more galleries in Buffalo and generally gaining exposure. At Hallwalls this coming Friday (First Friday in Allentown), Jozef Bajus will be doing a talk at 8pm for his opening reception of fiber work. Jozef Bajus is an Associate Professor at Buffalo State’s Textile and Fiber Design program and has also taught at workshops in NYC. He has won many awards for his artwork, using fiber designs to communicate his message and has had his work in galleries worldwide in Slovakia, Poland, Hungary, Japan, Korea, USA and Canada. Some of his work can be viewed on his website jozefbajus.com and will be on display at Hallwalls until December 19th. There is also a textile exhibition at Indigo Art by Nancy Belfer that is on view until November 9th. Nancy Belfer is another artist who utilizes fibers to execute her artistry. Belfer experiments with different yarns and fabrics and even dyeing. One technique she is known for using is the Batik dyeing technique. Enjoy!